Your pup will look scary cute in this ghost-themed Halloween Dog Harness Dress by Doggie Design. Embroidered "Too Cute to Spook"
If your cute pup is so adorable, it scary, this will be your girl's go-to look during the month of October to get noticed! The Too Cute to Spook Halloween Dog Harness Dress by Doggie Design features an all-in-one style combining the fashion of a dress with the function of a harness thanks to the reinforced D-ring at the waist. Your pup will look festive with the purple skirt with ghosts saying "Boo," plus the "Too Cute to Spook" embroidered applique on the bodice. A white satin bow accents the waist. Your pup will look perfectly coordinated this Halloween season with the included matching leash. For your boy dog, look for the matching harness vest (sold separately) These are limited-edition designs. Get yours before it's gone! 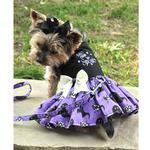 Halloween Dog Harness Dress by Doggie Design - Too Cute to Spook Customer Photos - Send us your photo! 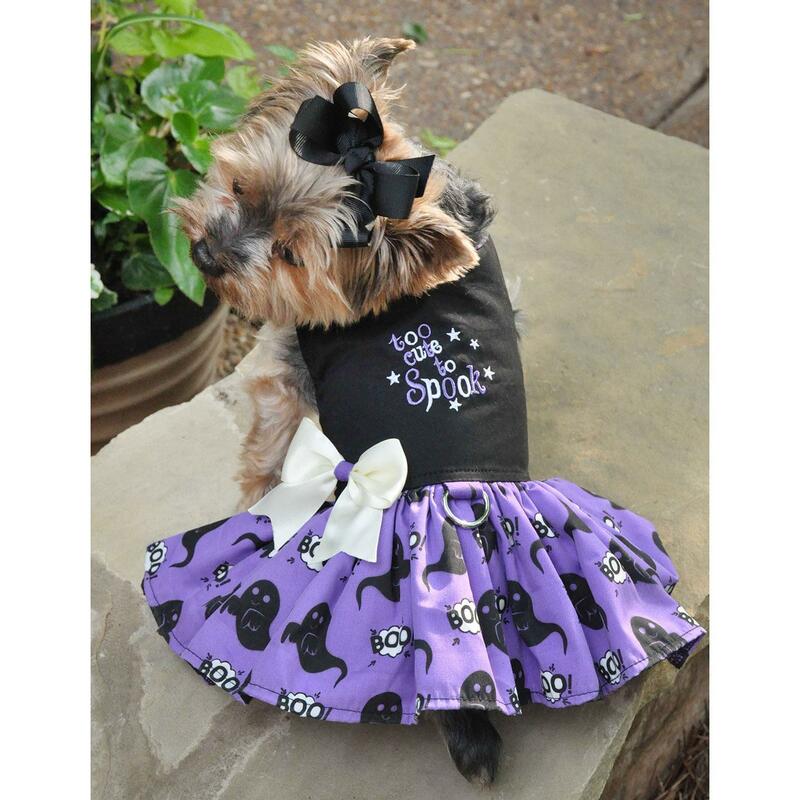 Halloween Dog Harness Dress by Doggie Design - Too Cute to Spook: This cute purple and black Halloween dress is so adorable on Miss Molly. She is a 20lb Cavalier King Charles Spaniel, and the size Large fits her perfectly. The matching leash is great! Holly is very good about dressing up for any occasion. Love this new Halloween dress. I am “too cute to spook”! Posted On 02/19/19 by Kelly S from Lancaster , OH Yes, Kelly S recommends this product! This Too Cute To Spook Halloween dress is just that, Too Cute! I got this as a gift from my mom and it’s adorable. A medium fits my 10.5 lb Shih Tzu and she can’t wait til Halloween to wear it. Definitely one of my favorite Halloween dresses. You’ll love it. Posted On 01/11/19 by Sandy from Stittsville, Yes, Sandy recommends this product! This will be a gift for our little Yorkie friend Tia and also ordered a 2nd one for our little Papillion friend Dani, after seeing how cute it is. Well made and matching leash is great. Thinking ahead for next Halloween! What a cute outfit and at a great price. I love the dresses Baxter Boo has for my girl. Very cute and non-traditional color. It is well made, fits well and easy to put on. Posted On 11/07/18 by Nicole C from Rochester, NY Yes, Nicole C recommends this product! Found this at a great deal....arrived quickly and the Small fits my 2-1/2 yr old, 8.5-lb Pomeranian well. Great quality and so cute on her! This is too cute!! I had been looking at these dog harness dresses for a while and finally decided to take a chance. I’m so glad I did. They are really adorable, Unbelievably well made and seriously too cute for words. I wish I could post pictures. The nice part is I love them and my sisters dog dolly doesn’t seem to mind them either!! Posted On 11/01/18 by Alyssa R from Dallas, GA Yes, Alyssa R recommends this product! It fit so well and was a hit during Halloween while we handed out candy. I was pleasantly surprised with how well it was made as well!! Absolutely perfect. This purple halloween dress by Doggie Design is extremely well made. The bow is so cute along with the embroidery on the bodice. The matching leash is perfect. Miss Molly is a 20 lb Cavalier King Charles Spaniel, the size Large fits her perfectly. Posted On 10/02/18 by Cynthis H,. from TERRE HAUTe, IN Yes, Cynthis H,. recommends this product! Miss Molly loves this cute Halloween Dress by Doggie Design. It is very well made and holds up well to washing & drying. The matching leash is perfect! Posted On 10/01/18 by cynthia h from Terre haute, IN Yes, cynthia h recommends this product! This dress is well made and is absolutely adorable. Posted On 09/12/18 by Lauren H from Allentown, PA Yes, Lauren H recommends this product! I have been a baxterboo customer for several years, I know all the sales that go down and all the coupons with free shipping. If I go over $50 I then can get free shipping and a better discount. ( after my coupon ) I also know sales don't last long most times sales are good for 2 days only but most times great super sales are only good for a day or just couple of hours. Halloween is coming so that's why I signed up to be notify when 2 very adorable Halloween dresses are in stock. ( I did this couple months ago ) Just my luck yesterday was 40% off " most items " I never thought Baxterboo would put " just in stock items on sale" ( they just got the new Halloween dresses in that day ) Since I am a " Pro Baxterboo customer " I know this sale was only 1 day only. I had to buy my must have items that day plus I had a awesome coupon. At first I was only going to get one new Halloween dress for my little Roxy. $14.99 each I just had to get both of them. Baxterboo you are the best !